Sony camcorder is mainly divided into Standard Definition Models (Sony DCR-) series and High Definition Models (Sony HDR-) series. Different models create different video formats. Standard Definition Models such as Sony DCR-SR47, Sony DCR-DVD650, Sony DCR-HC52, Sony DCR-SR45, Sony DCR-SR87, Sony DCR SX40, Sony DCR SX41, Sony DCR-SR220, etc, the video formats they create are MPEG-2 and DV (AVI). High Definition Models such as Sony HDR-CX100, Sony HDR-SR 7, Sony HDR-SR 5, Sony HDR-XR500V, Sony HDR-TG1, Sony HDR XR100, Sony HDR-CX12, Sony HDR-SR11, etc. The video formats they create are MPEG4 AVC/H.264 and MPEG-2. But only MP4, MOV video formats can be imported to Mac, that is why many of us always feel awkward that we could not import Sony camera video to iMovie, Final Cut Pro, Adobe Premiere Pro and other applications to do video editing. If we convert Sony MPEG-2, AVI video to MP4, MOV, then we can import Sony camera video to iMovie, Final Cut Pro, Adobe Premiere Pro, QuickTime, iTunes, iPod, iPhone, Apple TV, PSP, etc on Mac OS X (Mojave Included). 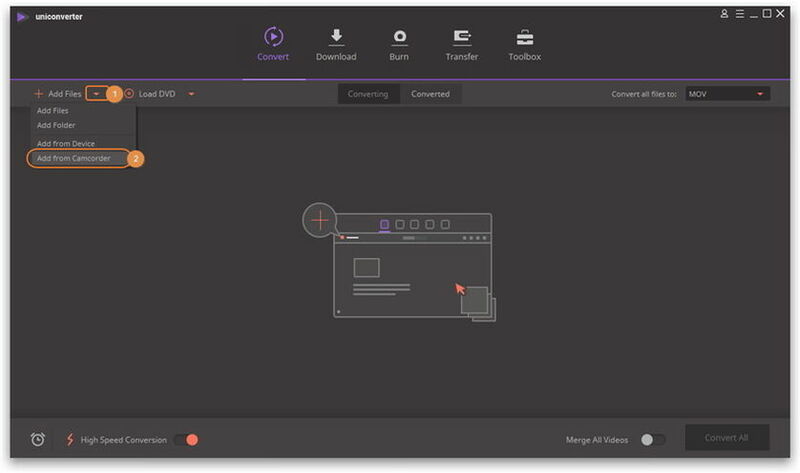 Wondershare Sony Video Converter for Mac is a good solution to convert Sony camera video like MPEG-2, MPEG-4, DV, AVI to any other video and audio formats like WMV, MOV, MP4, AVI, 3gp, etc on Mac OS X. And this smart app is available here. You can free download it for try. Convert video to 1,000+ formats, like AVI, MKV, MOV, MP4, etc. Download or record videos from 10,000 video sharing sites. All the output Sony camera video can be played on iPod, iPhone (iPhone OS 3.0), PSP, PSP Go, Apple TV, Nokia and other mobile players. Moreover, with this Sony Video Converter for Mac, you can also trim, crop, effect Sony camera videos on Mac. Step 1 Add your MPEG-2 files to the converter. Download, install Wondershare UniConverter for Mac (originally Wondershare Video Converter Ultimate for Mac), launch it on your Mac. Connect your Sony camcorder with your Mac. Then click the inverted triangle beside the Add Files button and select Add from Camcorder from the drop-down list. Your Sony camcorder videos will be detected from the pop-up video, select the videos from the list and click Add to List to load the videos. Step 2 Select the output format as MOV. Step 3 Start converting MPEG to MOV. After you have chosen the target format, click Convert All to start the conversion. After a while, you can find the converted videos in the output folder. It's an easy-to-use tool, right? Have a free try now!